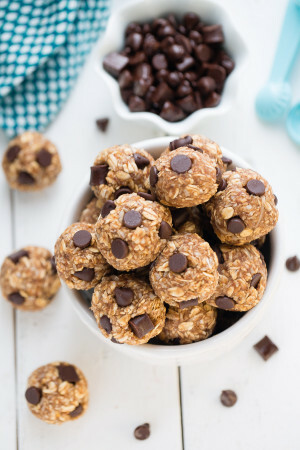 No Bake Almond Joy Energy Bites make the perfect easy, healthy grab & go snack. Best of all, they’re paleo friendly, gluten-free, raw, vegan and refined sugar free. 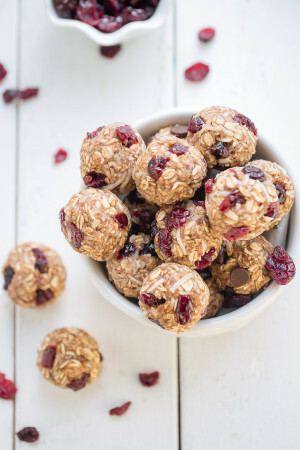 Despite all the desserts I share here, healthy recipes like these energy bites, salads, and smoothies, are what I turn to most. 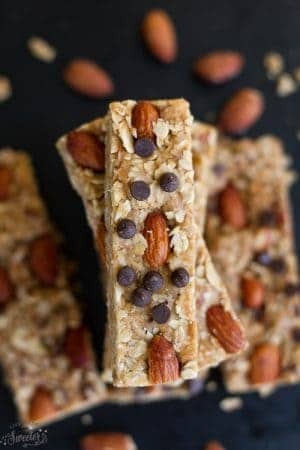 My kids are crazy about energy bites and granola bars. So at the beginning of the week, I love making a big batch and stashing them in the freezer to have on hand for the week. 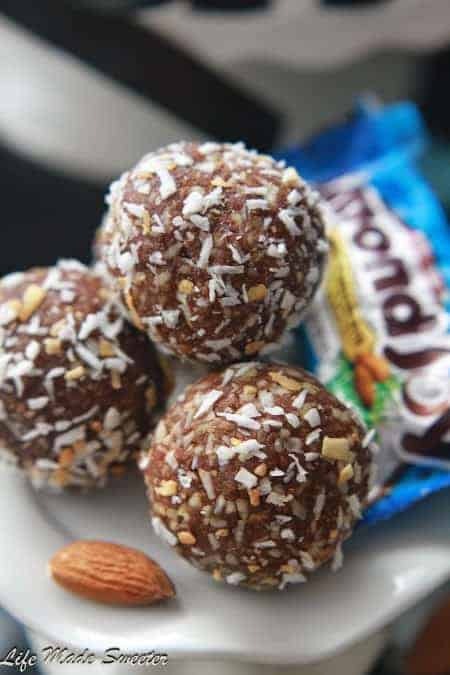 These Almond Joy Energy Bites are one of our favorite snacks. 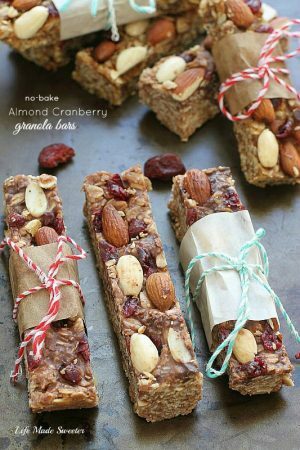 They are just perfect for after a workout and I love that I can play around with the ingredients depending on what I feel like. 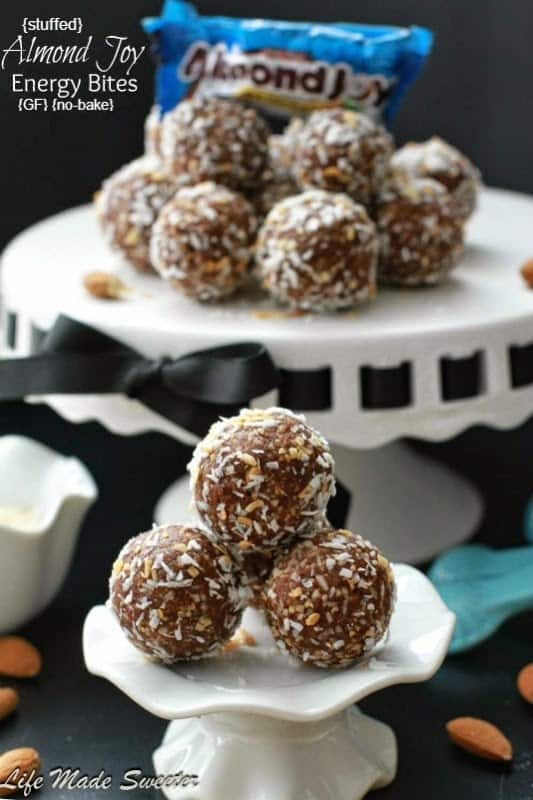 Just toss in some almonds, dates, vanilla, cocoa powder and shredded coconut into the food processor and roll away. For a fun surprise, I stuffed an almond inside which also adds a nice crunch. They are packed with fiber and protein to help keep my energy levels up. 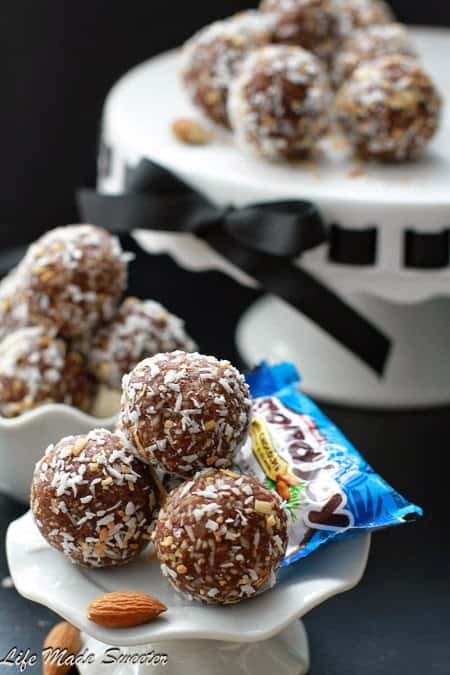 If you are a fan of coconut, chocolate and almonds, you are going to love these! I mean, they taste just like the Almond Joy candy bar!! 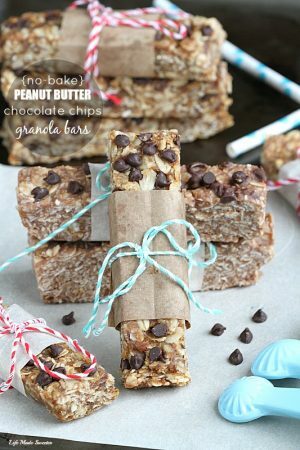 Seriously, so good but without the added guilt since they are made with healthier ingredients. Plus, they are super easy whip up in less than 10 minutes and ultra convenient. 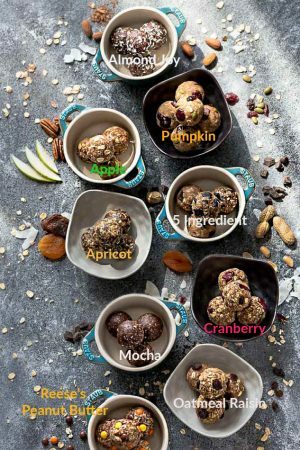 You can have them for breakfast to jump start the day or anytime you need a snack to satisfy that sweet tooth. Pack some into those lunch boxes or enjoy a few before or after your workout. And, they store easily in the fridge or freezer! So whenever you need something to keep that growling tummy happy, these are just the ticket! 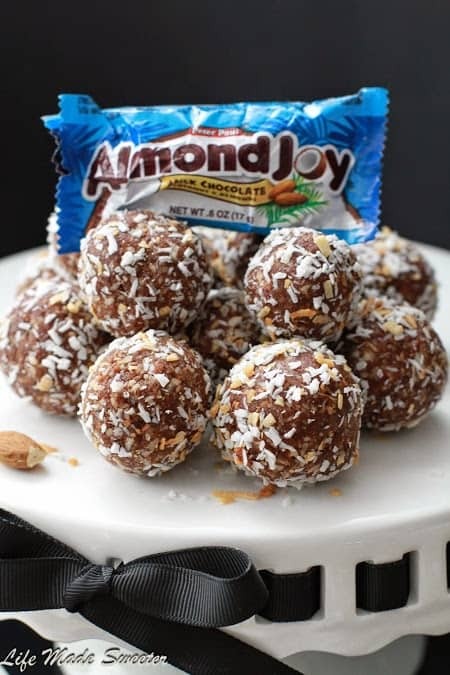 Energy Bites that taste like Almond Joy candy bars made with healthier ingredients to beat that chocolate craving! They are gluten-free, raw, vegan and refined sugar free. In the bowl of a food processor, add almonds and pulse until they are finely chopped (be careful not to pulse too long or they will start to turn into a paste). Add dates, coconut, cocoa powder and vanilla extract. Continue to pulse the mixture for about 2-3 minutes (scraping down the sides of the bowl as needed) or until the mixture easily holds together and sticks to the bowl. Using a measuring spoon, scoop out 1/2 tablespoon of mixture. Roll into a ball and flatten. Place an almond in the middle. Scoop another 1/2 tablespoon of the date mixture on top and roll into balls. Roll the ball into the bowl of shredded coconut topping. Repeat with rest of mixture. Store the energy bites in an airtight container in the refrigerator for up to 2 weeks. *I used pitted Medjool dates but you may substitute with any other pitted date but you will need to soak them for 20 minutes in water to soften first. Drain the water prior to using the soaked dates. *I use a mixture of toasted and untoasted shredded coconut for more depth of flavor and a pretty contrast of color. Feel free to use just one variety.